The beginning of Jesus’ public ministry is centred around Galilee: he’s on home territory. Having called the first disciples to help Him in the proclamation of the Good News of the Kingdom, Jesus goes to Capernaum with his disciples to teach on the Sabbath in the synagogue there. He teaches them, he explains the Jewish Scriptures, the Word made flesh, the Living Word, is among them. Their reaction is one of astonishment – amazement that he teaches them, not as the scribes but as one having authority. Rather than explaining human teaching in a human way, people are drawn closer to God, by one whose power and authority are derived from God, because that is who he is. Jesus can explain the Scriptures because he is the Way, the Truth, and the Life – He is the fulfilment of Scripture, and it finds its meaning in and through Him. There is a man in the synagogue who is not well. The Gospel uses the language of possession by an unclean spirit, whereas nowadays we would probably use the language mental illness. The man in his brokenness can recognise who and what Jesus is – the Holy One of God. The point of the Kingdom which Jesus proclaims, which he explains in his teaching, is that it is a place of healing. Ours is a God who can heal our wounds, who can take broken humanity and restore it in love. This is why Jesus’ teaching and the healing have to go together; they are both part of a larger whole, the coming Kingdom of God. Jesus proclaims our need to love God and each other, and puts it into practice, making the healing power of God’s love a reality in the world. From the very beginning, Jesus looks to the Cross, not as a place of torture, of humiliation, or defeat, but as a place of victory, and healing, as the supreme demonstration of God’s love for humanity – this is how much God loves us, this is why he sends his Son to heal our wounds, to restore us, and to give us the hope of Heaven. This healing love is what we have come to experience here this morning, where under the outward forms of bread and wine we are fed with the Body and Blood of Christ, so that their Divine nature might transform our human nature, might give us a foretaste of heaven, healing our wounds, taking away our sins, cancelling the debt which we cannot pay, so that we might have life in Him, in this world and the next. 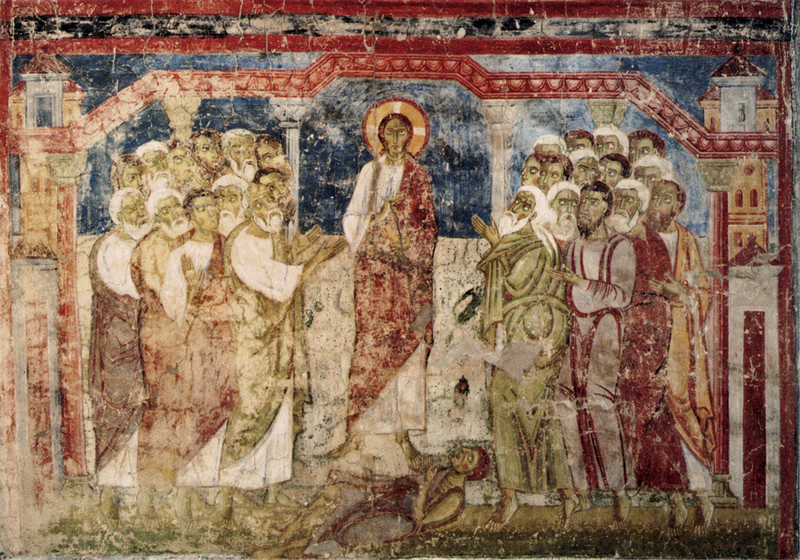 The possessed man asks ‘Have you come to destroy us?’ We know that Jesus has come not to destroy but to heal, so that we may have life and have it to the full – this is the Good News of the Kingdom, which is still a reality here and now – we in our brokenness can come to the source of healing, to the God who loves us and gives himself for us so that we can be healed and restored by Him. He can take our lives and heal us in His love. So let us come to Him, let us be healed by Him, that our lives too may be transformed, and let us proclaim to a world which longs for healing and wholeness the love of God in Christ. Isn't Christ contradictory in the gospels? One time hiding his mission another proclaiming it?